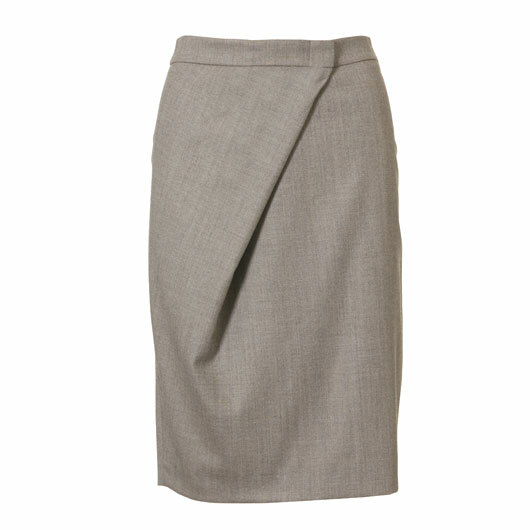 Remember how I ♥’d this skirt in the December Burda? 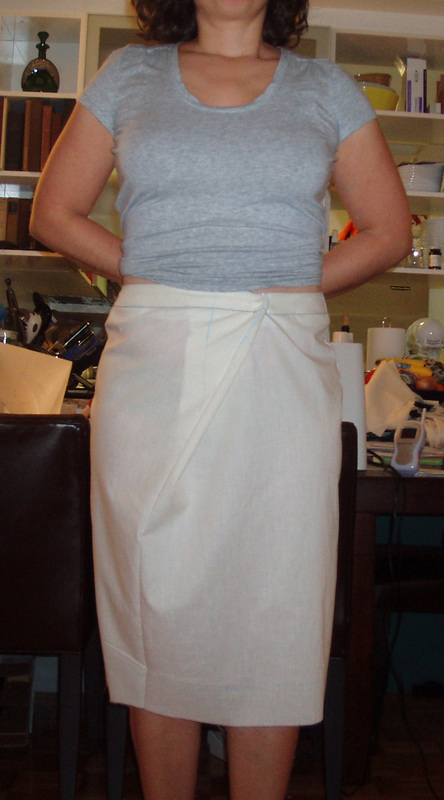 Well, I made up the muslin yesterday (sz 40) and it fit! Here’s a pic of my muslin. I can’t believe it but I actually understood all of the directions on my own without any help. It’s a 1.5 dot pattern with 1 dot being the easiest, hence the title of this post. It went together pretty easily. I hope making up the fashion fabric goes even better. 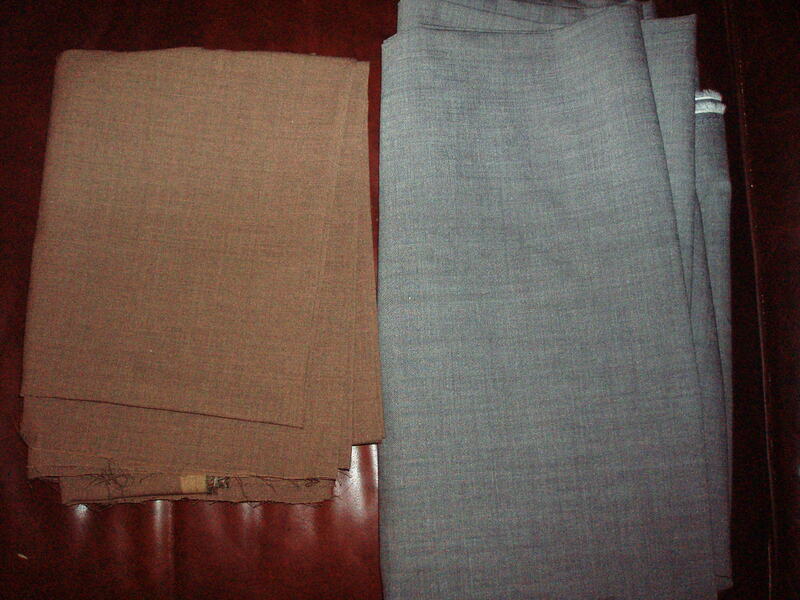 I pre-treated the fashion fabric (the grey one) by steaming it with a wet towel in the dryer and cut it out last night. I have two yards left I think, in case someday I want to make a matching jacket or a dress. Today, while Jack is napping, I’ll try to sew most of it. I am adding a lining using a method from this book, “Easy Guide to Sewing Linings,” by Connie Long. It sure sounds easy. Let’s hope that’s the case. This entry was posted in Beginner, Burda, Muslins, Sewing, Skirts. Bookmark the permalink. Cute skirt. I can’t wait to see the final result! Elizabeth – I’ve got that skirt fever too! Even though it doesn’t come in a plus size, I plan on working with it…though I think I’m taking a deeper pleat and stitching the pleat flat so that it won’t make my stomach look quite so big…well that is the thought now…I will let you know what I come up with! OOOOOO I loved that skirt, hope yours turns out perfect! It’s going to look great Elizabeth! Anytime you can understand Burda directions it’s a major accomplishment! Hooray! Oh goodie! You’re working on this one! Can’t wait to see it AND am very curious how you line it. I just couldn’t wrap my little brain around how to line it and not have bulk at that pleat so I left the lining out *LOL*. I just finished mine yesterday using a lightweight wool pinstripe. I’m planning on a solid color next. Your muslin looks good. You can sew on with confidence and make a beautiful skirt. Great start to a beautiful skirt. alright. I’m going to have to work this one out too. I have so many skirt lengths and all this chatter is pulling me in.